During June–July 2005, an excavation was conducted at the Bet Guvrin site in Nahal Qomem (Permit No. A-4432; map ref. 17885–913/61679–717; Fig. 1), prior to widening the Be’er Sheva‘–Tel Aviv railroad tracks. The excavation, on behalf of the Israel Antiquities Authority, was directed by P. Fabian, with the assistance of O. Feder (Area A supervision), I. Milevski (Area B supervision), H. Lavi (administration), A. Hajian (surveying and drafting), R. Goren-Rabinovich (archaeozoology) and the late G. Kedoshim (aerial photography). The site was first excavated in 1958by the French Center for Archaeology (Perrot J. 1961. IEJ 11:76; 1962. RB 69:387–388) and again in 1998 (HA-ESI 114:85*–86*); remains of a settlement that dated to the Late Chalcolithic period and the beginning of the Early Bronze Age were discovered. The current excavation lies east of the railroad tracks and was concentrated in the large area (600 sq m; Fig. 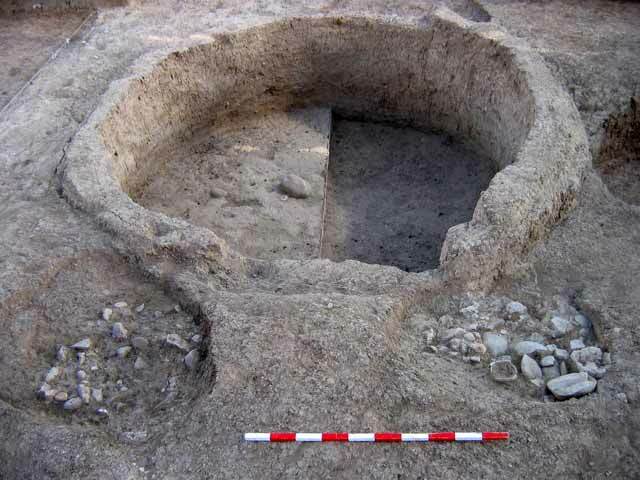 2) between those excavated beforehand, connecting to them. Consequently, we now have a broad uninterrupted sequence of the stratigraphy and the architecture at the site. Remains of two settlement strata that dated to the Chalcolithic period and Early Bronze Age II were exposed in the excavation. No evidence indicating the continuation of the settlement after these periods was found. Pits and remains of several walls were discovered in the upper stratum. This layer was severely disturbed by deep plowing. Most of the finds from this stratum dated to the beginning of Early Bronze Age II and a few dated to the Chalcolithic period. The lower stratum, which was better preserved, consisted of mostly shallow and bell-shaped pits that were abutted by floors, overlain with hearths, fragments of pottery and limestone vessels and bones. Several human burials were discovered for the first time at the site in this stratum; most of burials were in shallow pits with the remains of pigs alongside the deceased. A circular mud-brick building (diam. 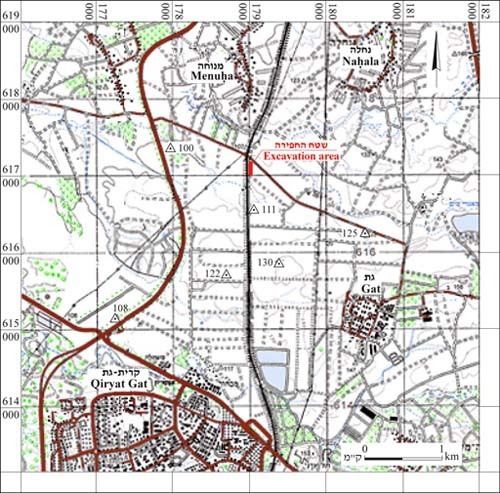 c. 4 m) with a unique plan was also discovered. A child burial was revealed inside the structure. Funerary offerings composed of several animals, among them a whole young pig and a whole leg of an ungulate, were placed above and next to the burial. Teeth belonging to an adult were also uncovered in this tomb, probably indicating that primary burials were performed in the building and later the remains were removed for secondary burial elsewhere. It seems that this unique structure was used for ceremonial interments. The finds in the lower stratum included fragments of pottery vessels, stone tools and flint artifacts from the Chalcolithic period. Noteworthy is an industry for producing limestone tools that is unique to this site. This industry included large numbers of scrapers, cutting tools and anvils, which constituted most of the lithic finds at the site. 2. 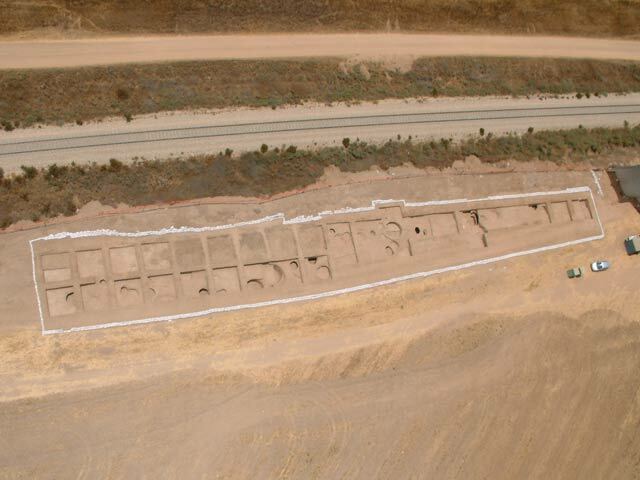 The excavation area, aerial view looking west.